Barge operators at work at the Barbados Bay jetty at Studley Park Tobago on January 26. Rehabilitation of the Barbados Bay jetty in Studley Park to allow for transportation of aggregate from the area’s quarry and construction material to Tobago is another step in the transformation of the island’s economy. So said THA Chief Secretary Kelvin Charles as he noted that the Studley Park quarry received its first barge in about 15 years on January 26, to export over 2,200 metric tonnes of aggregate to Trinidad. He said the shipments of aggregate were expected to earn revenues of over $1.2 million and were to be used in coastal protection works in Trinidad in places like Mosquito Creek in La Romaine, Cap-de-Ville (Point Fortin) and Sans Souci (on the northeast coast) and other places. “This facility will facilitate the berthing of barges for the transportation and export of aggregate and additionally it will also facilitate the importation and offloading of construction material like sand and cement for Tobago businesses. ‘Of course, part of the mandate is to ensure the generation of revenues from the quarry, and by extension for the Division of Infrastructure, Quarries and the Environment and the Tobago House of Assembly on a whole,” Charles told guests at the commissioning last Thursday at the jetty’s site. He said when his administration was elected into office in 2017, members immediately set about treating with the ‘vexing’ question of the Studley Park quarry, describing operations as far from efficient with operations coming to a grinding halt on many days. He noted also that many were the days when truckers slept overnight in their vehicles at the site to get a load of aggregate. Chief Secretary Kelvin Charles, centre, cuts the ribbon at the commissioning of the of the Barbados Bay jetty at Studley Park last Thursday. Others in photo from left, are Public Utilities Secretary Clarence Jacob, Infrastructure Secretary Kwesi Des Vignes, Studley Park Enterprises Limited Chairman Allan Richards, Finance Secretary Joel Jack, Community Development Secretary Marslyn Melville-Jack and Health Secretary Dr Agatha Carrington. He said the new operations started on November 65, 2017with a staff of 28 persons, including 11 persons from the previous workforce which was in excess of 160 persons despite a lack of predictability and reliability for procurement of aggregate. 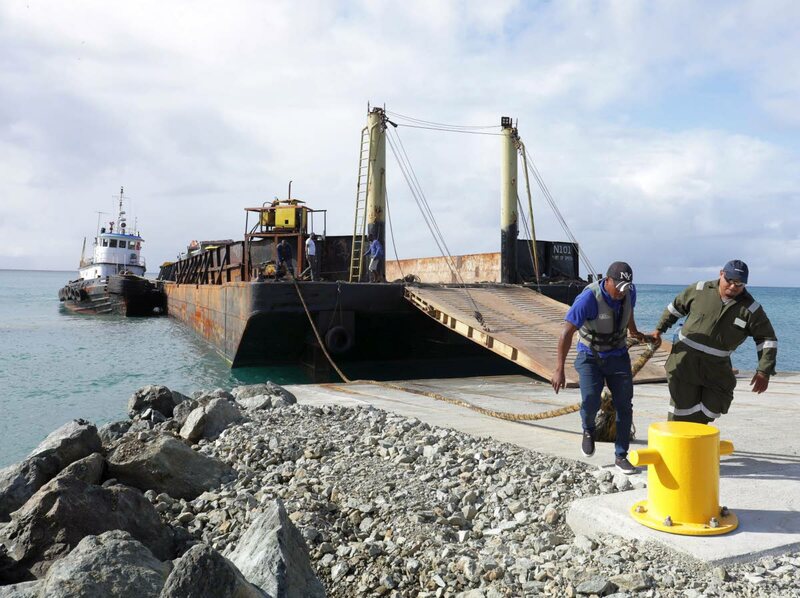 Rehabilitation of the jetty was completed in January with Trinidad-based RJB Building & Civil Engineering Contractors Limited was contracted under a design-build arrangement for the three-month project by the Studley Park Enterprises Limited (SPEL). Speaking at the commissioning, Miguel Donawah, General Manager of RJB, said the scope of works included repair of the road to the jetty, installation of a new ramp to accommodate barges coming in and leaving, as well as the construction of a vinyl wall to protect the barges and the jetty’s road from erosion. “The project completed within time and within budget… it roughly costs $3.5 million to $4 million, and Tobago can now boast of a world class facility,” he said. SPEL Chairman Allan Richards said jetty would show how resources can be utilised for the development of Tobago as well as Trinidad. Guests at the at the commissioning of the Barbados Bay jetty at Studley Park last Thursday. Richards said the intent was to develop Studley Park as a construction hub. “This wouldn’t be merely an exporting of the primary product, we anticipate developing an industrial manufacturing area for some of the concrete and possibly asphalt based products within the area that has been mined before in the quarry,” he said. Secretary of Quarries Kwesi Des Vignes said SPEL “can be the catalyst to build the future not only of Trinidad and Tobago but of the Caribbean. “We have andesite rock, which is the second hardest material, right here in Tobago, highly demanded resource… that we can use to build the future of the region,” he said, adding that this all becomes possible with the rehabilitation of the jetty. Reply to "Charles: SPEL jetty to transform Tobago economy"